In general Cluster A and B, the food security situation is classified as Minimally Food Insecure 70% households are able to access and consume food without changing livelihood strategies. Households have food stock for more than 4 months due to recent harvest of paddy. Paddy production was loss by 25-45% in 56 VDCs of cluster B due to drought. They are reported to have a good income from sale of livestock products (meat, milk, egg); income from sale of vegetables crops; good remittance inflow as well as wage opportunities in agricultural and construction fields. People are getting wage opportunity working in agriculture and local Markets. Market price of coarse rice gone up from Rs 35 to 39, compared to the last cycle. 83% people access of drinking water is available all-round the district with 25% HH have sanitation facilities. (Would be better if you could mention this in the analysis template as well) Additionally normal situation of acute malnutrition reported to be 0.7% in average as well as normal situation of climatic hazards (flood, landslides, etc). 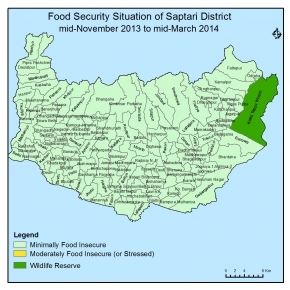 Saptari is expected to be remained normal as Minimally Food Insecure for the period of Mangsir to Falgun across the district. Households' food stock will be increased with the harvesting of Wheat (Wheat will not be harvested, pls review)as well as access to market purchases entire the district. Income from sale of livestock products (milk, dairy, meat, chicken, eggs, etc.) and cash crops (vegetables, Potatoes, Mustered etc. ); income from wage opportunities in construction and industrial corridor and agricultural fields as well as remittance inflow. Market price is expected normal the Sufficient stocks due to normal supply situation. Additionally, water supply system and sanitation facilities are predicted to be operational including normal situation of human diseases and climatic hazards.